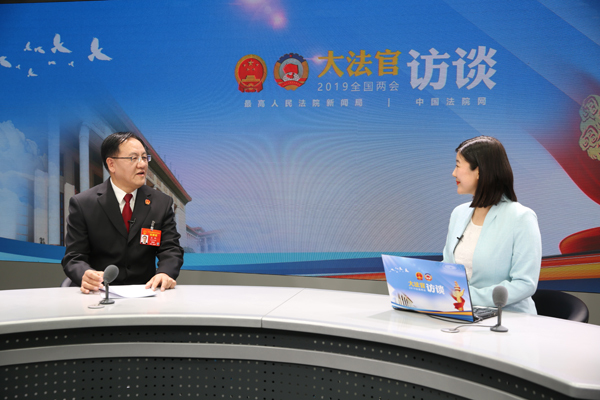 Kou Fang, a NPC deputy and the president of the Beijing Higher People's Court, visited an interview program jointly launched by the information bureau of the Supreme People's Court and chinacourt.org during this year’s national two sessions on March 14. In the interview, Kou shared with netizens about the achievements and experiences of the work mode of "multi-mediation and quick adjudication" in Beijing’s courts. The working mode has been referred several times by Kou during the two sessions. Kou said that in 2018, courts in Beijing made some progress. "The city's courts received 895,224 new cases, up 16.3 percent year on year, and 893,570 cases were closed, up 15.4 percent year on year. The city's judges settled 357.1 cases per capita, ranking first in the country,” Kou said. Kou believes that, in addition to having a team that conscientiously studies and implements Xi Jinping Thought on Socialism with Chinese characteristics for a New Era, the achievements have also benefited from the deepening judicial reform of Beijing courts and the establishment of the "multiple mediation and quick arbitration" work mode. With regard to the specific operation of the mode, Kou said that Beijing courts have taken advantages of various forces to play a role in mediating in the front end of lawsuits, and incorporated mediators in residence in courts into the judges' team, in order to open up the channel from mediation to quick adjudication to ensure timely and proper settlement of disputes. In the interview, Kou also specially mentioned that the mode is supported by the Party committees, governments, social coordination and other forces. In 2018, the work has been included in the three-year plan for multiple resolution of conflicts and disputes in Beijing (2018-2020). The construction of 14 grassroots courts' mediation and connection centers in Beijing has been approved and are making steady progress.